Award-winning actress and producer Sandra Bullock is known for her ultimate dedication to preparing for major roles. The 53-year-old star commits to a healthy but realistic diet and workout plan that get her looking her best for the big screen. Here are five main food groups from Sandra's diet to adapt into your meal plan for a healthier you! It's no secret that vegetables provide loads of essential nutrients and vitamins. Veggies can be prepared a number of different ways, but did you know that steaming them is one of the most effective ways to preserve them? Try incorporating easy-to-make sides such as steamed zucchini or okra into your daily meals. 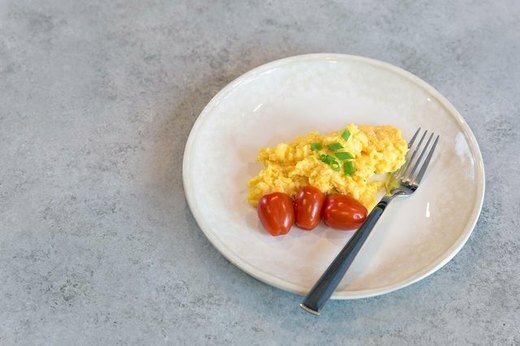 Healthy fats, protein and vitamins are just a few of the many reasons you should kick off your day with scrambled eggs. Adding fish to your meals is one of the best ways to increase your lean protein intake, and salmon is always a tasty option. It is a wonderful source of protein, B vitamins, omega-3 fatty acids and more. Try out a simple salmon sheet pan dinner, stuffed salmon or cedar plank grilled salmon for a delicious dose of protein. If you're preparing a meal and want to incorporate grains, going with brown rice instead of white rice can make a huge difference. You'll get plenty of B vitamins, iron and fatty acids. Essential vitamins, minerals and antioxidants are just a few of the many reasons you should be eating plenty of leafy greens. There are countless meal combinations that include leafy greens, but the simplest and quickest way is a good salad! Go for something classic like this house salad, a sweeter option like this arugula with roasted strawberry vinaigrette, or maybe something with a bit of a citrus twist like this spinach farro salad with orange and toasted coriander vinaigrette. The possibilities are endless! A healthier heart equals a healthier you, and black beans are the perfect food to get you there! Carbohydrates fuel your body, and wheat carbs can increase energy, intake of nutrients and more. While wheat bread may be the obvious food that comes to mind, a hearty wheat pasta meal like this whole wheat shrimp pesto pasta is another tasty option to mix things up. Green tea is known for its natural healing and anti-inflammatory abilities, and takes no time at all to incorporate into your daily routine. Just pour yourself a cup and you'll be on your way to better health in no time. Nuts and seeds are a tasty and convenient snack that provide your body with the perfect combination of protein and healthy fats. A handful a day is all it takes! Broccoli is rich in antioxidants and vitamins, and there are countless ways to prepare a tasty broccoli meal. For instance, start your day with this broccoli cheddar frittata, snack on roasted broccoli with garlic and lemon, or add this honey mustard chicken and broccoli sheet pan meal to your dinner menu! You know what they say–an apple a day keeps the doctor (and lots of unwanted health issues) away! Crisp, sweet apple slices are an excellent source of fiber and antioxidants and make the perfect snack for any time of day. These little fruits may be small, but they are mighty! Packed with antioxidants including Vitamin E and zinc, they make the perfect snack or salad-topper.